It may not be much of a looker, but MPowerSynth is versatile, sonically superlative and worth every penny. Powerful Normal oscillator shaping. Creative Harmonics oscillator. Sounds stunning. Good preset library. Extensive subsection presets. Good Arpeggiator. CPU hit can get very high. Following its impressive recent update to MDrummer, MeldaProduction's latest project is a synthesiser - its first, surprisingly! 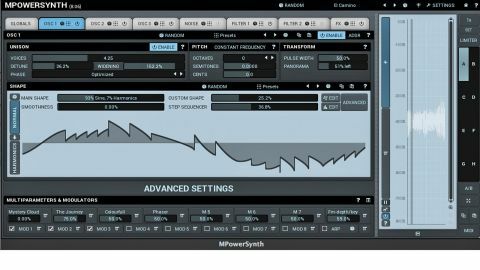 MPowerSynth is a three-oscillator instrument (VST/VST3/AU) with a noise generator, two filters and effects. Simple enough on paper, but in typical Melda style, this one goes way beyond the basics. At its core are three ultra-flexible aliasing-free oscillators, each operable in one of two modes: Normal or Harmonics. The former includes 16 wave shapes (Sine, Saw, Triangle and Noise, as well as combination shapes like Sine Square Root). "The oscillators are definitely MPowerSynth's greatest asset. The Normal oscillator mode is anything but..."
Harmonics provides a series of up to 255 sine wave harmonics (similar to additive synthesis partials but without individual detune), with Level and Phase parameters. The Normal wave shapes can be converted to Harmonics representations, too, and there's a library of instrument-sourced Harmonics presets (guitars, pianos, orchestral instruments and so on). Both oscillator types include Pitch (Semitones and Cents) and Pulse Width controls, and Oscillator 1 also offers up to ten Unison voices, with Widening (width), Detune and starting Phase offset controls. The oscillators are definitely MPowerSynth's greatest asset. The Normal oscillator mode is anything but, and you can modify its wave shape using the multipoint Custom Shape curve, which is 'applied' to the original waveform (0-100%). The same trick can be performed with the Oscillator Step Sequencer, which lets you modify the oscillator wave using a 32-step shape. You can also import single cycles from external waveforms (ie, samples) and dial in harmonics. Meanwhile, the Harmonics oscillator mode hosts a number of useful advanced settings (Sharpen, Clean, Harmonicity, Slope, etc) for generating and finessing harmonics. MPowerSynth's two filters are identical, boasting over 100 types, including very steep (120dB/ octave) examples of the typical shapes (low- pass, band-pass, etc), as well as Comb filters, Formant filters and combination types (Sub-X, Over-X and Band-X). The most interesting, though, are the combination Polymorph types. With these, the Character knob changes the filter structure, with each position switching to a tonally distinct filter. All of the filter types include Resonance, Frequency, Saturation, Dry/Wet mix and Drive parameters, and a Drive Mode control for influencing harmonic balance. On the modulation side of things, there are the eight standard flexible Melda Modulators discussed below, and powerful AHDSR envelopes for all main sections (Global, Filter, Oscillator and Noise Generator). These include Attack and Release stage transition points (Smoothness). The Filters also feature cutoff and resonance modulation via velocity- and note- based offsets. There's a fully fledged Arpeggiator hidden away at the bottom of the interface. This uses an intuitive 32-step parameter grid and is up to five- note polyphonic, so you can specify on a step- by-step basis which notes are used from a played chord, for example. Rounding things off at the 'front end' is a dedicated Noise generator with four flavours of noise, and a global FX section. The whole shebang is organised into eight tabbed windows, with further floating windows housing more advanced controls, including deeper oscillator parameters and global settings (polyphony limits, velocity response, glide times, etc). Each section of the synth can be switched on and off separately. "Synths often live or die by their preset libraries. MPowerSynth has over 1500 patches onboard, and they're excellent"
MPowerSynth includes the usual raft of 'advanced' Melda features: eight quick recall memory slots (A-H), ABCD Morphing, A/B switching, Automatic Gain Compensation, safety Limiter, eight Multiparameter controls, eight Modulators (for controlling multiple parameters via three generator options - Envelope, Random and Normal, the last being any of the oscillator types), the visual Style Editor, integrated copy and paste, and a very informative embedded help system. You also get adjustable upsampling (x1 to x16), high quality linear upsampling, and cross modulation and automation accuracy settings with which to balance audio fidelity against CPU hit. Finally, there are copious subsection-specific presets (including Filters, envelopes and FX plugins), and an abundance of randomise options. Although deep features are all well and good, the fact of the matter is that synths often live or die by their preset libraries. MPowerSynth has over 1500 patches onboard, and they're excellent. The leads are edgy and upfront with plenty of bite - special mention goes to the awesome Wildcafe Trancify supersaw patch - and the basses range from round and deep (JazzBass) to outright nasty (Drilll). The 250 pad presets really show off the best features of the synth, including shimmering bells (Anorectic Oleomargarine), evolving textures (Melonkaks) and more awesome riff-ready sounds (JP8000). The Percussive and Drum categories comprise mostly synthetic-sounding presets, with punchy kicks (Analogue Percussion) sitting alongside snappy snares and hats (Club Snare and Club HiHat). We also particularly like the FX folder, which has a good selection of risers, falls, sirens and hoover-esque effects for track transitions. Workstation-style sounds - pianos, organs, woodwinds and brass, etc - are reasonable, but bear in mind that they're artificially generated rather than sample-based, so not at all realistic. Plentiful sequencer and arpeggiator presets are provided as well, and these are also superb - we'd certainly welcome more of them in future updates. MPowerSynth definitely lives up to its confident name, and although the GUI is pretty uninspiring in a creative sense, even with its various colour and style options, fitting all this functionality into anything simpler would be tricky. Our only major criticism is that the CPU hit can easily head skyward as patches get complex, but other than that, this is an awesomely powerful, great-sounding synth that everyone needs to hear and try.